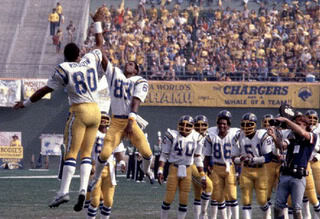 During the glory years of Air Coryell, the receivers were John Jefferson, Charlie Joiner, and Tight End Kellen Winslow. Head Coach Don Coryell had taken full advantage of the rule changes in 1978 to produce the most prolific passing offense in league history. His San Diego Chargers were the evolutionary link between Sid Gillman’s high scoring AFL version of the Chargers and the offenses we know today. Quarterback Dan Fouts was the trigger-man and was in the midst of building a Hall of Fame resume. In 1979 he broke Joe Namath’s single season passing record with 4,082 yards. Then shattered it with 4,715 yards the following year. So it was imperative that management keep top level receivers for Fouts to throw to. As a team they won the AFC West in ’79 and made it to the AFC Championship Game in 1980. However going into 1981, several players desired new contracts and were holdouts. Upset with the inability to bring WR John Jefferson and DE Fred Dean to camp, each man was traded to teams thought to be NFC wastelands in San Francisco and Green Bay. Although they were the odds on favorite to make it to Super Bowl XVI before this, management pulled the trigger that could have brought down Air Coryell. Wes Chandler scoring on a punt return in the “Epic In Miami” 1981 AFC playoff against the Dolphins. Yet they had an ace up their sleeve and traded for Wes Chandler a few weeks later. Whom they were sure could fill the shoes of former All Pro John Jefferson. You have to understand Jefferson was the most electrifying talent in the league. 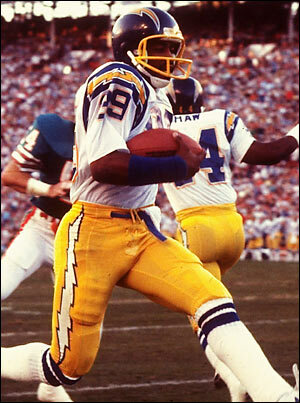 His circus catches and boundless enthusiasm was the lightning rod spirit of those Charger teams. Asking Chandler to fill his shoes was not going to be easy. Yet week 6 of 1981, right before the trade deadline, the Chargers turned in their trade papers to Pete Rozelle’s office. Yet first you need to understand the man he was going to replace. John Jefferson’s first 3 seasons with San Diego, they set the record and broke it for passing offense each season. His years from 1978-1980 were the most electric of any incoming receiver in NFL history. The acrobatic Jefferson produced highlight reel after highlight reel level catches. He amassed 199 rec. for 3,431 yards and 36 TDs as 1/3 of Air Coryell!! In this vignette about the ’80 Chargers you’ll get a better glimpse. His battles with Lester Hayes that year were epic. Hayes was NFL Defensive Player of the year as he amassed 13 interceptions. Jefferson had 2-100 yard receiving games against him and 3TDs. Both were voted All Pro as he had a career best 1,340 yards on 82 receptions and 13 touchdowns. 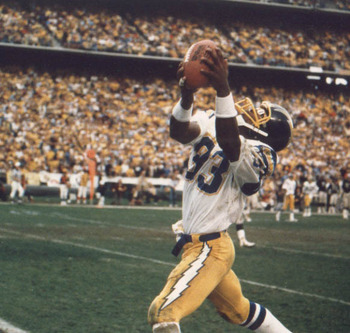 In fact, the 1980 Chargers were the first team in history to have the standard set of receivers (2 wideouts and tight end) go over 1,000 yards in the same season. Against the Giants in week 7, they became the first standard set to all go over 100 receiving yards in the same game. Now they were going on without his services. How would the Chargers fare? That 1982 season by Chandler ranks in The Chancellor of Football’s top five all time seasons by a receiver. He caught 49 passes for 1032 yards and 9 touchdowns in that strike shortened season. Just 8 games. Projected over a full season he would have had 98 receptions for 2064 yards and 18 TDs. At the time, 101 was the record for catches by Charley Hennigan back in the AFL in 1964. The TD record in a season was 17 held by Hall of Famer Elroy “Crazy Legs” Hirsch from 1951. He would have become the first and only 2,000 yard receiver and come close to or broken the other two records. John Jefferson went on to team with James Lofton and made the Packers a formidable passing team for several years. In fact he made his fourth and final Pro Bowl in 1982 when he and Lofton went as teammates. However his best days were left in the team he should have helped to a Super Bowl in San Diego. Contract disputes kept that team from it’s greatest triumph. When you picture Air Coryell in your mind, these two and their acrobatic catches are the first you envision. They were the spectacular performers of the group where Hall of Fame voting went with the numbers and impact of Charlie Joiner, Dan Fouts, and Kellen Winslow. Amazingly Head Coach Don Coryell also sits outside the Hall of Fame. Too much is made of a coach not winning a Super Bowl yet Joe Gibbs left his staff and won 3 in Washington. He deserves to be in as well. The high flying Chargers of the early 1980s. Just as we remembered them. Although Chandler and Jefferson didn’t have Hall of Fame numbers, these two shouldn’t be forgotten for their contributions were just as great. Definitely legends of the fall. This entry was posted in Legends Of The Fall and tagged Air Coryell, Don Coryell, John Jefferson, San Diego Chargers, Wes Chandler. Bookmark the permalink. I always knew John was special,At Dallas Roosevelt High School,he wore the name John Washington, He later legally changed his name to John Jefferson his mother maiden name , He explained that there was a shortage of males on her family side and he wanted to be sure her name was kept alive. A great talent, Everyone knew he would be a big success. Both great players, both overcome by”Ego.” Always kept me on the edge of my seat. 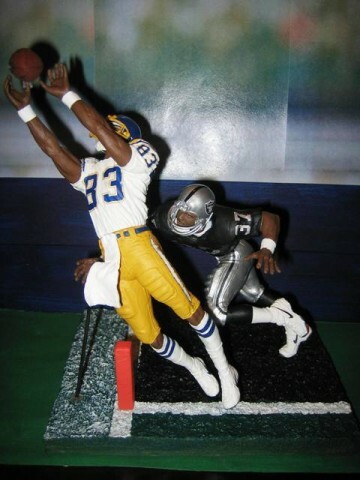 Chuck Muncie liked his drugs better than football. What a shame. Chunck Muncie was a big part of that offense too. He could run but he was a good receiver in his own right. I suppose everyone had to be in that offense.